I’m showing it here out of its case because I scanned the tintype on my flatbed scanner while I had the packet apart to clean the cover glass (some idiot decided to stick the price tag to the cover glass with cellophane tape that was not a “magic” residue-free tape). This one was a minor splurge as I’m trying to keep myself to a budget, but given the overall quality I felt it was well worth it. 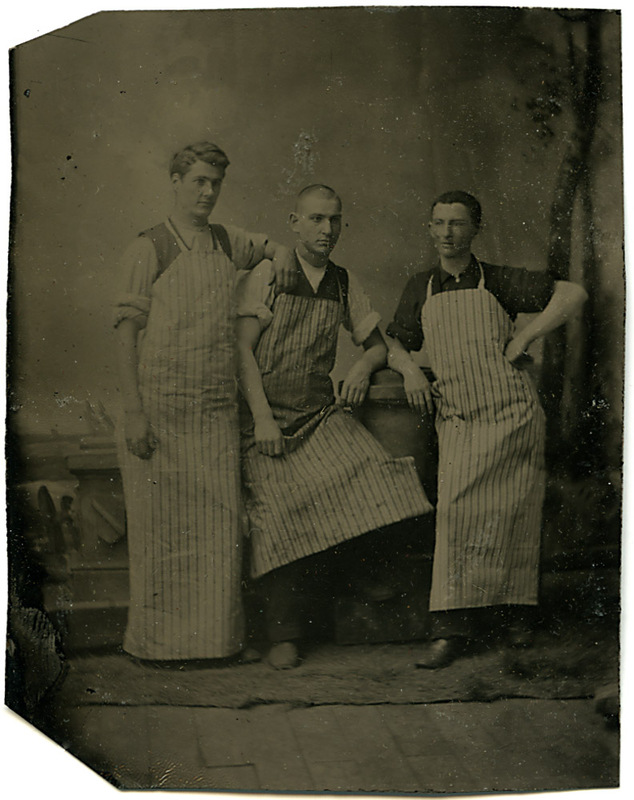 As to the subject matter – does anyone have any idea what profession these gentlemen might have? My first thought was butcher, but they don’t seem to be wielding any butcher’s knives or have any of their product with them. My second thought went to baker, but again, no bread in the photo, and I’ve seen bakers before holding bread. Perhaps greengrocers? Shop clerks? The aprons are rather long for general store clerks, I think, but I’m not an expert on 19th century tradesmens uniforms. Very unusual aprons. So long. The guy in the middle’s one seems to be stained, so could be blood? They look like btchers but as you say, no tools. A fascinating item. I’d be glad if it was mine.